ALS and the NFL: Is There a Connection? The ice bucket challenge, in which individuals challenge one another to either dump a bucket of ice water on their heads to raise awareness of amyotrophic lateral sclerosis (ALS) or donate funds to the ALS Association, has become a phenomenon on social media. Tim Shaw, a 30-year-old retired NFL player announced this week that he is suffering from ALS and challenged the Tennessee Titans (his former team) and the Penn State football organization to participate in the challenge. His announcement adds to the growing concern regarding a potential link between professional football and ALS; he is the fourth NFL veteran to receive an ALS diagnosis in the past seven years. 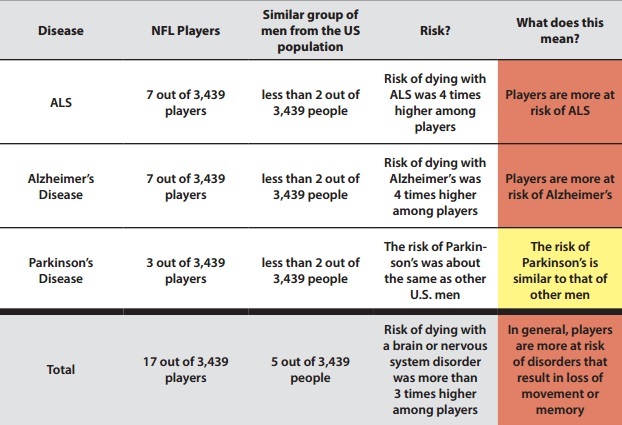 A CDC study found that NFL players were four times more likely to receive an ALS diagnosis vs. non-NFL players, in addition to being at an elevated risk of Alzheimer’s disease. “Speed” position players such as running back, defensive back, and linebacker are at the greatest risk of neurodegenerative diseases. The NFL agreed to pay $765 million to settle a concussion lawsuit brought forth by former players in 2013 which includes paying compensation to former players and their families for cognitive injuries. The ALS Ice Bucket Challenge just got personal — again — for NFL players: Tim Shaw on Tuesday announced that he’s suffering from amyotrophic lateral sclerosis, also known as Lou Gehrig’s Disease. The researchers concluded that “speed” position players, like running back, defensive back, and linebacker — Shaw’s position — were at higher risk of neurodegenerative disease. Close more info about ALS and the NFL: Is There a Connection?